The excruciating facial pain of Trigeminal Neuralgia is caused by compression of the trigeminal nerve at the root entry zone by a blood vessel in 96% of cases. The offending vessel is usually a tortuous loop of the superior cerebellar artery although other vessels can be involved. The neurosurgeon can perform direct microvascular decompression of the trigeminal nerve. This achieves long term complete pain relief in the majority of patients and avoids destruction of the trigeminal nerve, thereby avoiding the complications of facial numbness, dysesthesia, corneal anesthesia and ulceration as well as the dreaded anesthesia dolorosa (extreme constant burning pain after neural destructive procedures). The pain of Trigeminal Neuralgia is distinctive when it manifests itself in full; in fact it is the history of the pain and only the history that can make the diagnosis. There is no diagnostic study, not even an MRI scan, that can make the diagnosis. Even the physical examination is most often normal with no evidence of sensory loss or motor weakness of the face, although touching “trigger points” on the face during the physical exam may reproduce the pain. 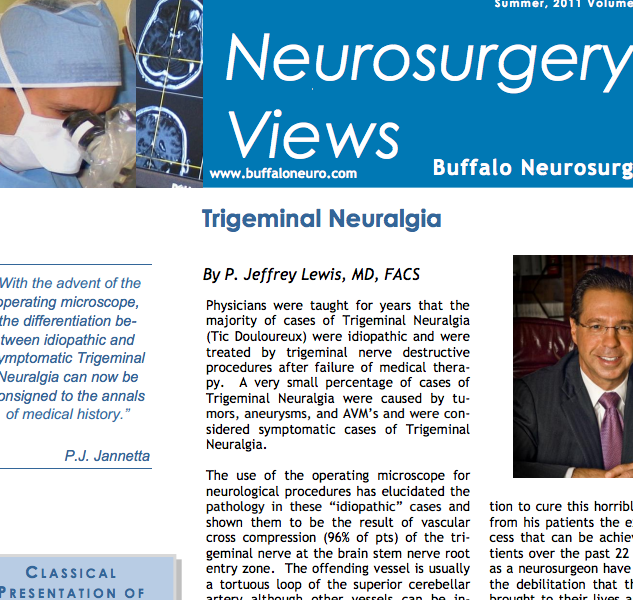 To view a PDF file providing a detailed presentation of Trigeminal Neuralgia click above. Unfortunately, many patients with Trigeminal Neuralgia undergo unsuccessful dental procedures (tooth extractions, root canals) in the early stages of the disease. 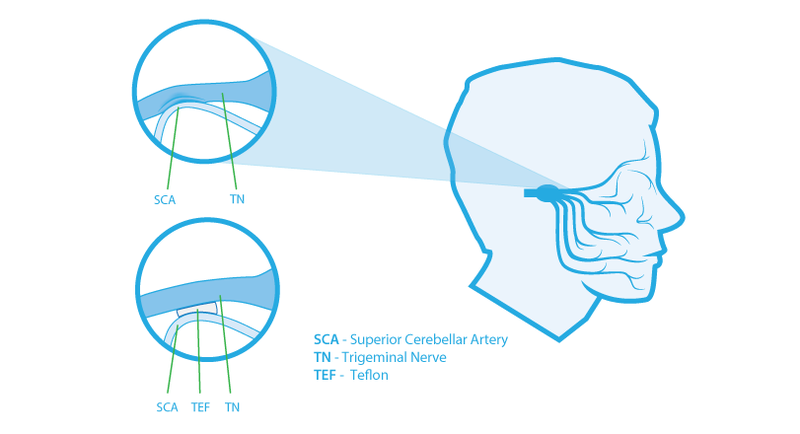 There is medical treatment for Trigeminal Neuralgia and the medication of choice is Tegretol, an anti-epileptic drug. In fact, an initial good response to Tegretol is another confirmatory characteristic of the correct diagnosis of Trigeminal Neuralgia. This fact can be very helpful in distinguishing Trigeminal Neuralgia from other conditions such as atypical facial pain. Unfortunately, the positive response of pain control that Tegretol has is just that – control, and not a cure. Although medications are extremely helpful in controlling pain for patients, they unfortunately do not cure pain and at higher doses, side effects are very common and often debilitating. The most gratifying neurosurgical procedures performed for pain are those that can completely eliminate the pain like the Microvascular Decompression procedure for Trigeminal Neuralgia. Please click on the link below for more detailed information on Trigeminal Neuralgia. certainly know how to bring an issue to light and make it important. Quality articles or reviews is the crucial to attract the users to pay a quick visit the website, that's what this web page is providing. ҝeep it up! Ι'll go ahead and bookmark ｙоur site to come baсk inn thｅ future.